Dark, brutal and raw. This is a young adult novel for young adults with a lot of spine. The story takes place on a spaceship called the Australia. The people on the ship have no knowledge of where they are going or hope of leaving the ship. They just know that they can’t go back to earth. Over hundreds of years the ship has grown old. It has been pulled apart by the inhabitants and any law and order that there may have been has broken down with mindless gangs like the Lows and the Bells gradually taking over more and more of the ship. Our story begins with a young woman, Chan, publicly killing her (already sick and dying) mother in the hope that it will convince the gangs that she is so tough they should leave her alone. Chan’s world is violent and lonely. Neighbours are too scared of the gangs to help each other and slowly more and more people are killed by the gangs. The mantra is always to look after yourself it isn’t safe to help anyone else. But, despite promising her mother to be selfish, Chan isn’t able to sit, idly, by while other people are tormented. So, in the face of overwhelming odds, she tries to help the people that she can. In doing so, she earns the enmity of the deranged chief of the Lows, which makes life even more challenging. The story is essentially the struggle of retaining your humanity and hope in the face of overwhelming odds, brutality and fear. It is a really gripping read, but there were several parts that were so graphicly disgusting that E had to put up with the odd outbursts of “gross” and “ergh” from the bookfort. The ending was also really sinister. Perfectly set up for the sequel which I will read when I’m feeling brave enough. 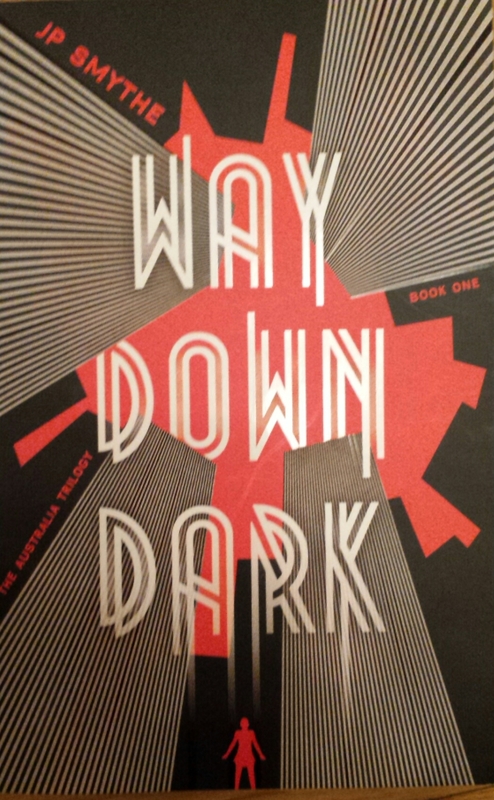 Tags: Australia, book, book review, books, JP Smythe, Way Down Dark. Bookmark the permalink.